Greiner Bio-One manufactures blood and urine specimen collection systems for the medical industry, including plastic evacuated collection sets and accessories, decapper instruments, erythrocyte sedimentation rate (ESR) analysers, and capillary blood collection systems. In the mid-eighties, Greiner launched its first blood collection system made with polyethylene terephthalate (PET) plastic. This design included a safety cap, which prevents users coming into contact with patient’s blood and ensures transportation safety. With increases in the prevalence of infectious diseases, the protection of medical staff is of high-importance. The VACUETTE® Blood Collection System addresses that concern, presenting users a safe method of taking blood. The VACUETTE® system has become a trendsetter and while many components have since been copied, none reached Greiner Bio-One’s high-quality design. 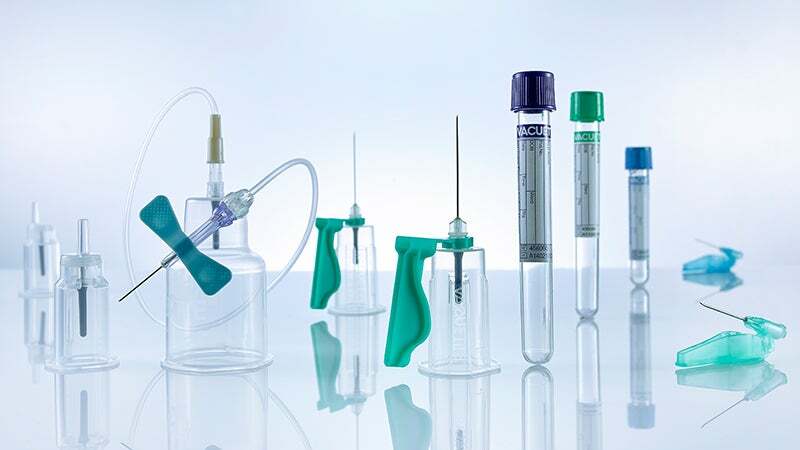 The company also produces collection devices for urine samples, as well as other specimen collection equipment such as needles, sharps disposal containers, different types of tourniquets such as the VACUETTE® Super T, and containers for the safe transport of specimen material. Greiner Bio-One is dedicated to providing high-quality products, which adhere to pharmaceutical industry safety guidelines. The company’s products follow electric commerce (EC) directives and US regulations (21CFR) and are manufactured accordingly. The company has also been awarded ISO 9001:2008 and EN ISO 13485:2012/AC:2012 certificates to certify that its quality management system conforms to these requirements. In addition, the VACUETTE® system contains a Conformité Européene (CE) mark and is compliant with ISI 6710 and EN ISO14820 international standards for single-use containers for blood collection. Partnering with hospitals, medical research institutes, and universities, Greiner Bio-One has expertise in the development, production, and distribution of laboratory products for the biotechnology and pharmaceutical industries. The company’s three divisions Preanalytics, BioScience, and original equipment manufacturer (OEM) work together to generate turnovers of €427 million. Greiner employs 1,800 people across its 23 subsidiaries and works closely in more 100 countries. Greiner Bio-One is part of Greiner Holding, which is based in Kremsmünster in Austria. Greiner Bio-One has developed a newly-designed capillary blood collection tube featuring an integrated collection scoop and a co-molded cap for collection and sampling. Greiner Bio-One’s new VACUETTE® CAT Serum Fast Tube is one of the first on the market to combine the quality of serum analysis with the speed of plasma analysis. It is the optimal tube whenever results are needed fast. In response to high demand for Greiner Bio-One safety products, the existing range will be joined by the new VACUETTE® SAFETY Winged Set. As always, the aim is to provide functional, user-friendly and patient-friendly product solutions. Strategic innovation partners gespag and Greiner Bio-One have introduced a new digital system solution to the Steyr pilot hospital. Following a successful launch of the new capillary blood collection system last autumn, Greiner Bio-One now presents the new MiniCollect® Complete tube as the ideal complement to its innovative system. Greiner Bio-one has announced it has added a new product to its range of safety solutions in an attempt to eliminate the risks of needlestick injuries. In some situations, only low quantities of blood can be taken in order to ensure patients are as safe and comfortable as possible. Greiner Bio-One has found the optimum solution for reliable diagnosis of diabetes in the form of the new VACUETTE® FC Mix tube. An accurate analysis of the bacteria count in urine is extremely important for the diagnosis of urinary tract infections. Greiner Bio-One (India) Pvt. Ltd.